Provide comfort for the family of Sonya-Leigh White with a meaningful gesture of sympathy. Donations are being accepted for: Brain Tumor Foundation of Canada. We encourage you to share your most beloved memories of Sonya-Leigh here, so that the family and other loved ones can always see it. You can upload cherished photographs, or share your favorite stories, and can even comment on those shared by others. Sending love and light in honor of Sonya White. 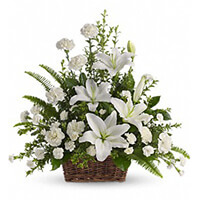 Scott Macdonald purchased the Peaceful White Lilies Basket for the family of Sonya-Leigh White. Mia, our class is so sad to hear about the loss of your mom. We know that she will always be a part of your heart. We love you!